As the temperatures have been miserable, I have been on the hunt for more indoor stuff to discover with the kiddos, face it there is just so much Wii & TV time we can take! 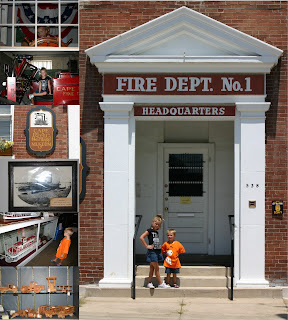 Last Thursday we decided we would head over to the Cape Girardeau River Heritage Museum and see what it was all about! The Cape Girardeau River Heritage Museum is located at 538 Independence Street Cape Girardeau, MO. The building was constructed in 1909 and served as the Police Headquarters, Fire Station, and Courthouse Jail. Today there are bits and pieces of evidence left behind of what the building was used for and today the building houses many pieces of the Southeast Missouri's River Heritage.